These are my first impressions after reading The Snow Queen (Joan D. Vinge; 1980) in May 2011. Some spoilers. Tiamat’s culture and history are shaped by the oddities of its planetary and solar system orbits. Every 150 years, it moves closest to one of its suns, bringing a long summer to the planet. This signals a complete power shift, as the Summers move north from the equatorial regions and the Snow Queen abdicates to the Summer Queen. In fact, the Snow Queen and her consort are sacrificed to the sea in a paganistic ritual following a multi-day festival similar to Carnivale or Mardi Gras. During the same period, the planet orbits close to and then away from a black hole that enables interstellar travel to other planets in an empire called the Hegemony. While Tiamat is close to the black hole, the Hegemony maintains a presence there, sharing technology with the ruling Winters. When the planet starts to orbit away, the Offworlders must leave, and they destroy all technology before they go to keep Tiamat from advancing too much without their influence and perhaps declaring independence. The Offworlders’ interest in Tiamat comes down to the planet’s one valuable asset: immortal sea creatures called Mers. The Mers’ blood, called the Water of Life, can be harvested to provide ever-lasting youth. The Snow Queen takes place at the cusp of this great Change. The 150-year-old Snow Queen, Arienrhod, has been scheming to maintain her power after the Summers take over. Her plan involves cloning herself, producing her Summer twin, Moon. But even though the two look alike, they are diametric opposites in personality. Arienrhod is self-absorbed and power-hungry, emotionless in her extreme age, a manipulator of everyone she meets. Her young twin Moon is compassionate and empathetic, someone who inspires adulation and devotion in everyone she comes across. Moon has become a sibyl, a prophetess who can answer any question. Through this power she taps into an ancient network of knowledge and discovers the true significance of the Mers and why they must be protected. This prompts her to compete for the mask of the Summer Queen and the power to, as she puts it, change the Change. Moon and Arienrhod are both in love with Moon’s cousin, Sparks. His character is probably the novel’s biggest flaw, because it seems implausible that these two strong women would go to such lengths for him. Sparks is narcissistic, petulant, and tends to make rash decisions or sulk when things don’t go his way. His character doesn’t improve or change much over the course of the story. He commits atrocious crimes, witnessed by Moon, who still wants to be with him even when much more attractive options are available to her. This is a long novel that probably could have been a good deal shorter, but there is enough action and interesting dynamics to keep the reader involved. In fact, I would like to know more — about the ruling planet of Kharamough, for instance, and its rigid class structure, which we visit only briefly. Clearly, the novel is setting up for a sequel, since many conflicts are left open-ended and the resolution is not quite satisfying as a result. The Snow Queen won the Hugo Award in 1981. The sequel, The Summer Queen, was published in 1991, and a third novel in the trilogy, Tangled Up in Blue, was published in 2000. Vinge also published a novella, World’s End (1984), set in the same universe. 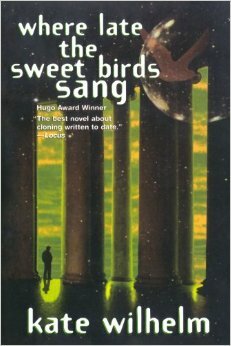 These are my first impressions after reading Where Late the Sweet Birds Sang (Kate Wilhelm; 1976) in August 2008. I will be discussing Where Late the Sweet Birds Sang in future essays. Spoilers. In this post-apocalyptic novel, civilization has been destroyed by some unspecified means involving environmental degradation, pandemics, and famine. But one extended family, seeing the end coming, has used their wealth to isolate themselves in a well-protected valley and has constructed the hospital, labs, and mill they will need to survive. Short on food, they develop cloning techniques to produce more livestock. When they find that most of them have become infertile, they start cloning themselves as well, with unforeseen consequences. The story is told in three parts, each following a similar arc, each ending in a main character leaving the family’s compound. In the first section, a brilliant doctor helps develop the cloning process but is ousted by his own younger clones, who are already exhibiting disturbing behaviors, such as losing their individual identities. In the second part, a clone is separated from her sister clones when she goes on an expedition to look for supplies in the ruined cities. As a result, she develops an individual personality and an artistic vision that the other clones interpret as madness when she returns to the compound. She must flee to keep from living a life as a drugged-up “breeder.” In the final section, her son is being raised by the clones but clearly doesn’t belong among them. Only he has the ingenuity and creativity necessary for continued survival as the machines and systems set up by the original survivalists begin to break down. What I thought about as I read this book was recent news stories about children so micro-managed by their “helicopter” parents that they have no ability to cope with the real world and break down as soon as they get to college. The young clones in the story reminded me of younger generations so coddled that they cannot make a decision on their own. How can we survive and advance as a species when we lose our individuality and cannot think for ourselves? is the question. This is exactly the dilemma faced by the clones. They become so used to a life where they never have to think for themselves that they lose all of their creativity and problem-solving abilities. They become dependent on machines they don’t understand, and when those break down, they cannot come up with creative ways to fix them. So they are doomed. Only those who can establish an individual identity through isolation from the main group are able to learn how to survive. It may seem on the surface that this novel is a somewhat dated horror story about cloning. But look deeper–the story brings up issues that are very relevant today. Wilhelm is raising a warning flag that we should safeguard our individuality and nurture our creativity if we want to survive.